The Prestige APS-997Z-VSS™ Kit will arrive at your door complete with all the parts and information you'll need to install the system into your specific vehicle. And if you have any questions before, during or after the install, we have professional installers with years of hands-on experience on call 70 hours a week, 7 days a week. Have the VSS Advantage™ on your next install today! Lifetime Tech Support available 70 Hours a Week, 7 days a week! Advanced SST Remotes "Spread Spectrum Technology" with an Operating Range that can Reach Up to 1 Mile! Not only are the remotes to the 997Z-VSS rated best-in-class in quality and performance they are designed with the most secure form of radio frequency transmission technology currently available on any automotive system today. In addition to nearly eliminating any RF interference and providing quicker response and stronger range, this latest technology shift's the transmitters operating frequency continuously making it impossible for a thief to copy and rebroadcast your transmitter's code. 5-Button remote (3 on the side) back-lit indigo blue screen that runs off of a single AAA battery (included) for several months with a battery-saver mode setting for even longer battery life. It's 2-way confirming abilities will enable you to confirm successful remote starting of your vehicle, remaining run time, doors locked, unlocked, power trunk activation and much more all on screen and all within 1 MILE of your vehicle. Controls all the standard features of the system from the same distance as the 2-way remote just without the 2-way confirmation. Chromed metal reinforced to withstand the daily wear & tear of hanging from your keychain. The remote starter is activated by pressing the remote start button on the remote 2X within 3 seconds. This setting helps prevent any accidental activation that could occur with a single press activation. 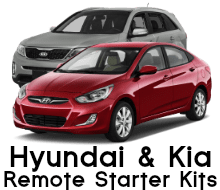 The remote starter will remain active upon entering the vehicle and during the ignition being turned on with the key and when you step on the brake to shift into gear the remote starter shuts off yet the vehicle remains running without have to restart the vehicle with the key. Mandatory connection that will immediately shut down the remote starter system if you step on the vehicle's brake pedal before you put the key into the ignition and turn the ignition on. Your choice of 5, 10 (standard time) 15, 20, 45 and 60 minutes custom-set run times available. Choice provided during checkout. Pre-set your vehicle's heat settings prior to exiting your vehicle will enable you to pre-warm the interior and defrost the windshield the next time you activate the remote starter. Same with the vehicle's AC, just pre-set the AC settings where you like it and it will pre-cool the interior on those hot days from it sitting in the sun. A cool feature that allows you to keep the engine running without having to leave the keys in the ignition: While the engine is still running with the keys, you press the remote start button on the remote 2X and when you turn off the ignition and remove the keys the engine will remain running for the duration of the remote start run time. Now you will be able to exit the vehicle and remotely lock the doors, leaving it running without the keys in the ignition. Visual confirmation when you lock or unlock the vehicle's doors or activate the remote starter: The system will flash the vehicles parking lights when you lock or unlock the doors and right after you activate the remote starter. After remote start activation it will turn the parking lights on solid shortly afterward to confirm that the vehicle is running via the remote starter. The system has the ability to automatically turn your vehicle's interior/dome lights on at the same time you unlock the doors with one of the systems remotes for 30 seconds. Feature offered during checkout. The system will alarm all your vehicle's doors and sound either the vehicle's or a siren (choice) when any of the vehicle's doors are opened and send a signal to the systems 2-way remote to notify you of the intrusion. The system will trigger if any high-impact is made to the vehicle, for instance, if someone was to back into the vehicle or try to tow it away. This sensor will also send a signal to the systems 2-way remote to notify you of the impact. One quick press of the lock or unlock button will send a pulse to your vehicles horn for audio confirmation or hold either button for 2 seconds and it will silently lock or unlock the doors. Theres also a quick procedure where you can completely turn the audio confirmation off or on at any time. Locate your vehicle in crowded parking lots! Press & holding the lock button on one of the systems remotes for over 3 seconds will activate the car finder feature which will pulse the vehicles horn and flash the vehicles parking lights for 30 seconds (or you can stop it from sounding sooner just by pressing the button again). Ignition Controlled Door Lock and/or Unlock: Many newer vehicles on the road today have auto-locks which locks the vehicle's doors shortly after you begin to drive, if your vehicle is not equipped with this feature you can order this system to provide it. And it can be custom pre-configured for you with in a few ways: Auto-lock with ignition ON only, Auto-lock & unlock with ignition ON/OFF or just unlock doors with ignition OFF or completely OFF for vehicle's already with the factory feature. For vehicle's equipped with a power trunk or hatch release, just press & hold the remote's trunk icon button for over 3 seconds and it will separately pop open your vehicles trunk (or hatch). Commonly and easily mounted on the inside top-center of the vehicle's windshield for optimum range, the antenna conveniently incorporates both the system's valet button and status LED. This eliminates any hole drilling to the vehicles dash and reduces the amount of wire's needed to be run under the dash during installation. 3 available ignition/crank delay settings for Diesel engines. The system will be pre-set for you with any one of the pre-set times available. Your choice of "wait-to-start" times are: 10, 15, or 20 seconds before crank to allow for proper glow-plug warming. You will be able to easily change this setting if need be after installation. This option will keep your engine running to allow your vehicle’s turbo to properly cool down before shutting the engine off. This system has 3 available turbo timer run times: 3, 5 and 10 minutes. If you need it, the choice is provided during ordering. In the rare event of a system failure or auto related electrical problems the 997Z-VSS system cannot prevent you from normally starting your vehicle with a key. If you ever have a problem with the system in the future the RS997-VSS has built-in diagnostics that utilizes your vehicle's parking lights to indicate a flashing code indicating the problem. Just count the flashes and call, email or txt and one of our tech's will assist you with determining the problem. The 997Z-VSS is available in the VSS platform for over 500 different models of vehicles. You will be asked to indicate the year, make and model of vehicle the system will be installed into during ordering. If in the rare event that one of our technicians finds that the system is not available in the VSS platform for your specific vehicle, we will email you the status within 1-24 hours, void the order and promptly release your payment. For more advanced installer's looking for a system that has auxiliary outputs for future expandable options like window roll-up/down, sunroof control etc. this system has 3 negative auxiliary outputs and each can be adjusted to 1 of 5 different timed outputs: pulse, push & hold, 10 sec. latched, 20 sec. latched and latched ON/OFF. Call us for complete details. 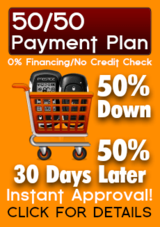 3 Year VIP Warranty: Our Best Warranty Ever! 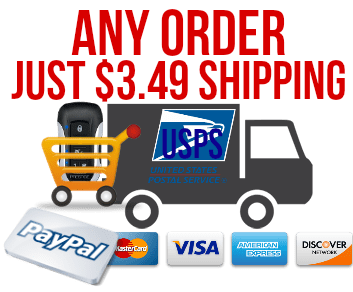 In the rare event that you have a problem with your system within 3 years from date-of-delivery, just contact our technical support department and after they determine the problem, they will email you a USPS return shipping label for the defective part and ship you the repaired or replacement part within 2 business days of receiving the defective part at no cost to you! Remotes carry a 1 year warranty only. And if you happen to be out of warranty, you still have lifetime tech support and will receive a VIP 10% discount on any out of warranty replacement parts you need. 3 year warranty coverage extends only to full systems installed successfully that failed under normal every day wear & tear due to factory defect or QC issues. No need to give up one of your vehicles keys (or purchase a 3rd key) in order to install a remote car starter in your vehicle: The NKR ("No Key Required" for operation) bypass interface kit included with a VSS system only requires your vehicle's keys for programming, not operation, meaning you don't have to stick one of your keys in a box, mount it under the dash and wrap an antenna loop around your ignition cylinder. No surfing the internet, no videos to watch, no sitting with a lap-full of "spaghetti-wire" and jumping from wiring chart to manual, trying to figure out what wires are needed (or not needed) to connect to your vehicle. 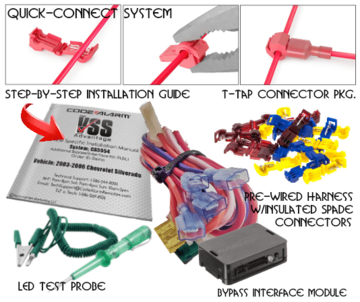 Each CA5554-VSS system include's a step-by-step vehicle specific installation manual to indicate exactly what wire from the system connects to what wire in the vehicle, where the wire is located and how to confirm that you found the correct wire using the VSS kits supplied LED style test probe. No need for using awkward multi-meters that indicate voltage level's that can confuse readings and require the use of two probes and a bare spot on the wire in order to take a reading. Each of our VSS kits includes an easy to use LED style test probe to use along with the VSS kits step-by-step vehicle specific installation manual. This test probe simplifies the procedure of finding and testing for the correct wire in your vehicle by lighting a green or red LED to indicate the target wire's polarity (explained in each step of our vehicle specific install manuals). Each VSS kit includes 3 different size's of quick-connect "T-Tap" connectors with male spade connectors machine crimped to the ends of the systems wiring for making quick connections from the system to your vehicle's wiring. Also included are crimp cap connectors for connecting wires end-to-end and self-tapping screws with ground loop connectors for making chassis ground connections to the vehicle. Nylon zip ties are also supplied for securing wiring, control module and sensor placement. You will be asked to indicate the year, make and model of vehicle the RS997-VSS system will be installed into during ordering. If in the rare event that one of our technicians finds that the system is not available in the VSS platform for your specific vehicle, we will immediately email you, cancel the order and promptly release your payment.